Version 2.6 of our most popular program adds support for Kelvin, U model (enhanced range) monitors, and now DIALUP VOICE ALERTS via an optional hardware voice dialer. It also allows probes to be disabled and to have longer probe names. The latest version of our software features an intuitive graphical interface with industrial style flag annunciators for "at a glance" status checks. Supports Models E4, U4 and U16, plus the low cost Model F Serial port version too! 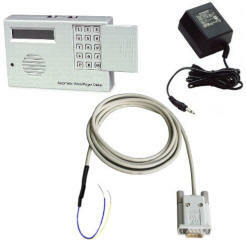 TempElert will also report switch and relay status from burglar alarms and limit switches. Includes settable limits, automated logging, and automatic email and pager alerts. 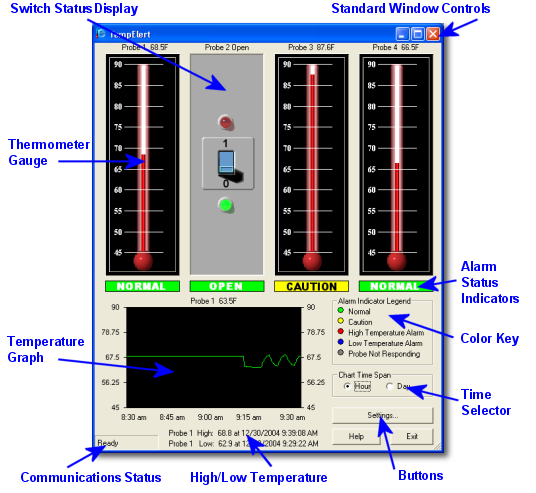 Plus we now have support for Windows Server 2003/2008, and a new photo realistic on-screen thermometer. A command line switch was also added for server administrators to kill or launch the TempElert process. Now an affordable and simple solution makes remote temperature monitoring and alerting easier than ever before! Both RS232 and Ethernet models are available and when combined with our exclusive TempElert software, you have a full featured monitoring and alerting solution. TempElert also comes with PowerBug! - a utility to shut down PC's or Servers in an overtemperature condition! This program can save your entire server room containing thousands of dollars of PC equipment! TempElert can now make a telephone call and delivery of pre-recorded voice messages to any regular telephone, cell phone, or voice pager. Support for multiple recipient numbers and remote cancel features are included. This device offers an improved level of alerting by using the telephone to succeed where emails and pager text messages may not. The TempElert Automatic Voice Dialer features busy-line and no-answer detection to ensure prompt transmission of up to 2 prerecorded messages delivered sequentially to as many as 4 standard telephones, cellular phones, voice and/or numeric pagers. Messages to both local and long-distance calls can be transmitted. When activated, the dialer instantly begins calling the numbers in sequence, delivering each message 1 to 3 times in a row, in accordance with the pre-selected number of dialing attempts. The TempElert Automatic Voice Dialer is programmable, offering customization to fulfill virtually any residential or business alerting requirement. Plain-English prompts on the LCD screen walk the user through the process in a timely manner. Store up to 4 telephone, cell phone, or voice pager numbers. Choose 1- 9 calling efforts for the numbers dialed. Record a variable combination (maximum: 3) of instructional outgoing messages (total elapsed time: 51 seconds). Program up to 2 separate input channels with individually enable/disable, entry/exit delay and activation options (Normally Open (N.O. ), Normally Closed (N.C.) (dry contact or voltage activation) including momentary and continuous activation for each). Further individualize each channel by selecting the delay times, telephone/pager numbers to be dialed and the specific outgoing messages to be played. Our EXCLUSIVE TempElert Standard program e-mails, pages or calls (with optional voice dialer hardware) when temps or switches reach threshold values you set! Easy to configure, stable, relied upon in thousands of installations since 2003.